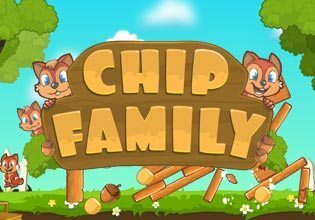 The cute Chip Family is making ready for the winter in this HTML5 puzzle game. Alvin, Jeanette and the other chipmunks need your help to restock acorns before it is getting too cold. You have to place the little rodents so they can chip away some blocks and make the rest of the blocks drop on the acorns and shell them. In the beginning it's quite obvious which blocks you have to remove but you will have to think laterally soon. 40 levels packed with challenging puzzles, super cute graphics and of course tons of fun will keep you entertained and engaged for hours. Play Chip Family now for free and help them to get through the winter!